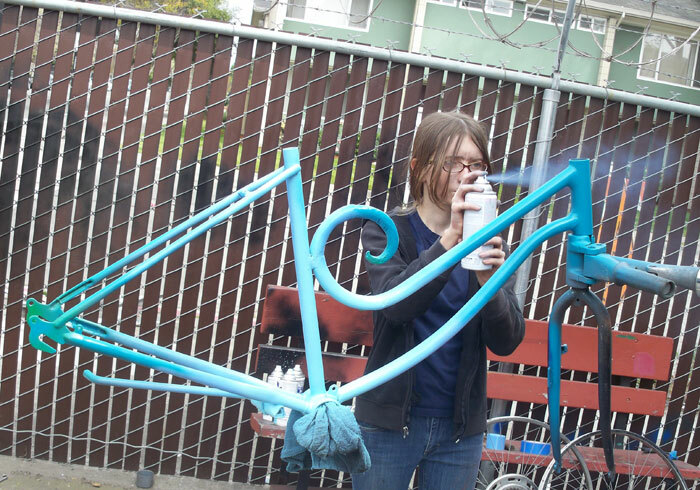 A program participant of the Bike Bridge welds her bike in the welding course, hosted by The Crucible. The Black Rock Arts Foundation is thrilled to announce the award of $10,000 granted from the National Endowment for the Arts for our newest project, The Bike Bridge. This new project, which launched in April of 2011, is the next evolution of our community-focused public art projects. This educational and creative program is designed specifically to engage youth living on Oakland, California. The Bike Bridge is a collaboration with the youth of Oakland, artist Michael Christian, and with partner organization The Crucible. 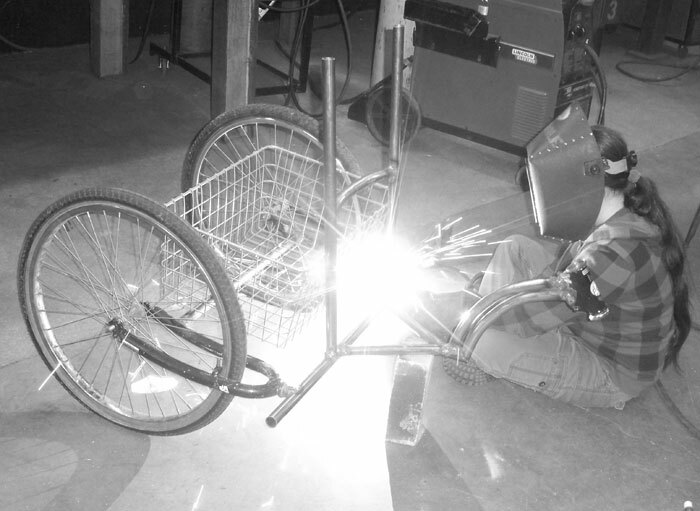 The 12 enrolled participants, all young women, begin the project with classes in welding and art-bicycle creation, generously hosted by The Crucible. The program culminates in the collaborative creation of a large-scale sculpture made entirely of reclaimed bicycle parts, led by Christian. In the second phase of the project, artist Christian will work with The Crucible’s instructors and the youth participants to design a “skeleton” structure that can later be embellished by the youths. These embellishments will be made of reclaimed bicycle parts, connecting with “green,” urban bike culture and tapping into the exciting, creative buzz around “art” bikes. The Bike Bridge sculpture is designed to be the centerpiece of the City of Oakland’s new Uptown Merritt Art Park, to be located adjacent to the Fox Theater in the city’s newly revitalized Uptown district. The City of Oakland was also awarded an N.E.A. grant, in the amount of $200,000, a portion of which will fund the development of the new park. Plans pending, The Bike Bridge sculpture will act as a gateway to the park, which will also feature temporary exhibitions of large-scale works of art. N.E.A.’s grant of $10,000 sets this ambitious project in motion. Fundraising efforts are underway to meet the project’s overall budget of $60,000. Help us reach our goal!